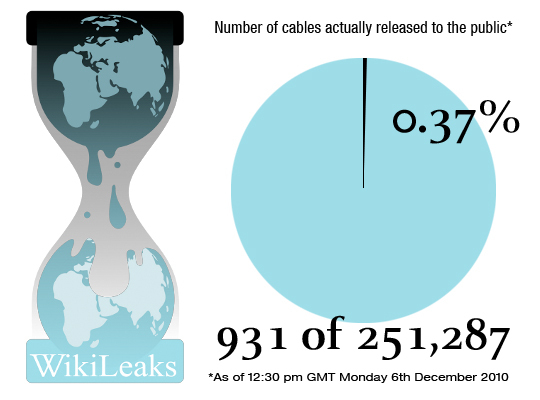 Number of WikiLeaks cables actually leaked to the public (so far). I find it interesting that there seems to be little coverage of the actual number of WikiLeaks Cablegate cables/documents that have actually been released to the general public. When watching the evening news, listening to the radio or reading about this in the news the journalists seem to imply that the entire 250 thousand documents are out there for anyone to read but in actual fact these cables/documents are being drip feed to us by a selected group (see below). The United States diplomatic cables leak began on 28 November 2010 when the website WikiLeaks and five major newspapers published confidential documents of detailed correspondences between the U.S. State Department and its diplomatic missions around the world. The publication of the U.S. embassy cables is the third in a series of U.S. classified document “mega-leaks” distributed by WikiLeaks in 2010, following the Afghan War documents leak in July, and the Iraq War documents leak in October. The first 291 of the 251,287 documents were published on 28 November, with simultaneous press coverage from El País (Spain), Le Monde (France), Der Spiegel (Germany), The Guardian (United Kingdom), and The New York Times (United States). Over 130,000 of the documents are unclassified; none are classified as “top secret” on the classification scale; some 100,000 are labeled “confidential”; and about 15,000 documents have the higher classification “secret”. WikiLeaks plans to release the entirety of the cables in phases over several months. I guess the point I am trying to make from this visual is that not very many of the cables have actually been released yet and based on the rate so far of 931 in 8 days than we roughly have another 2,162 days to go before they are all made public. i.e. just under 6 years! This entry was posted in Data Visualisation and tagged Cable Gate, Cablegate, Infographics, Statistics, Visualizations, WikiLeaks. Bookmark the permalink. Post a comment or leave a trackback: Trackback URL.